Valentine's Day is a day to celebrate your love for another. This time, also show your love for the planet by choosing organic and natural flowers, chocolates, lingerie, candles and more. This Valentine's Day, why not show that special someone how much you really care? Show your love for the environment as well with organic and fair trade certified flowers, chocolates, lingerie, a candlelit dinner and more. The rose is a symbol of love: flawless beauty...intoxicating aroma. It may surprise you to learn just how intoxicating those roses actually are. Because flowers are classified as a non-food commodity, growers are allowed to use toxic pesticides that also poison their workers. The U.S. imports millions of roses from Mexico, Colombia and Ecuador. A high percentage of these workers are women, specifically in Colombia and Ecuador. And in Ecuador, some of those workers are children. These workers and their families suffer illnesses caused by direct exposure to pesticides, as well as pesticide residue brought home from the fields and greenhouses. Low wages and unfair labor practices only make things worse. Organic Bouquet offers flowers sourced from growers committed to the highest social and environmental standards. Their flowers are grown and harvested using practices geared to improve the quality of farm working conditions, minimize damage to ecosystems, conserve biodiversity and enhance environmental quality for future generations. Each bouquet in their collection is hand selected and shipped fresh from the farm, ensuring optimal product quality upon delivery. Organic Bouquet flowers are certified USDA Organic and Veriflora Certified. For more choices, check out our list of online organic flower suppliers. Without question, a box of chocolates goes hand in hand with a bouquet of roses. 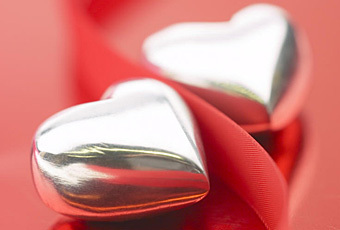 If you truly love that special someone, why on earth give him or her a box filled with hormones, antibiotics and toxins? If you are buying conventional chocolates, filled with creamy ganaches, that is exactly what you are doing. As reported in our article about organic chocolate, conventional chocolates contain more than you have bargained for. Whatever you decide, show your love for the Earth as well as your loved one. Instead, give a box of organic chocolate truffles. Lillie Belle Farms, The Chocolate Alchemist, Rapunzel Pure Organics, Sweet Earth Chocolates and Nature's First Law all offer truffles that are either organic and/or fair trade certified. Order from them and show your love for the environment as well. Go to the organic chocolate suppliers list for links to these and other organic and fair trade chocolate suppliers. Ok, so maybe you won't find anything racy or even whimsical for your loved one this year, but expect more organic cotton lingerie to surface in the near future. Why is organic cotton important? Conventional cotton is grown using an alarming amount of pesticides and fertilizers  roughly one-third of a pound of fertilizer to raise a pound of cotton, according to The Sustainable Cotton Project. That means danger to the environment and danger to cotton workers. Oh, and that common thread of low wages and unfair labor practices as well. But we don't eat cotton, so why the fuss? The answer is two-fold. First, chemicals used to grow the cotton leach into our water supply and are carried by air currents into neighboring farms and communities. Second, cottonseed oil is an ingredient commonly found in cookies, snacks and prepared foods, and other cotton byproducts are used in animal feed. No, we don't eat cotton, but we are exposed to the toxic chemicals used for conventional cotton farming. Victoria's Secret recently announced a new organic Pink line of lingerie to debut Spring 2008. In the meantime, look for organic underwear, nighties and robes at some of these online retailers: Good Humans, Rawganique, Janice's, Blue Canoe, Skin Lingerie, Gaiam, Enamore (UK), Spirit of Nature (UK) and g=9.8 (France). What a romantic way to poison your loved one! If you are using conventional wax candles, that is exactly what you are doing. Most candles are made with paraffin wax. Ooh, paraffin wax...sounds exotic, right? Wrong. Paraffin wax is a byproduct from gasoline refinement. It is the sludge from the bottom of crude oil barrels, bleached with benzene (a probable human carcinogen according to the EPA), then texturized with acrolyn (a known carcinogen). Then it is dyed and perfumed so it won't smell like diesel fumes when you light it. How romantic. A better choice would be candle made with beeswax  recommended by the American Lung Association  or soy. Both are renewable resources and neither contribute toxic residues when you burn them. When looking for candles, organic is of course a better choice, knowing that pesticides were not used in obtaining the wax. Also look for cotton or hemp wicks (again, choose organic when possible). If you can't find good candles locally, check out our list of online organic candle suppliers. In addition to what has been covered already, there are a growing number of organic and natural choices for Valentine's Day or any day. Make dinner using all organic ingredients. Enjoy your dinner with some organic wine. Eat organic ice cream for dessert. Or make a nice basket of organic fruit and snacks for a quaint picnic. Whatever you decide, show your love for the Earth as well as your loved one. © 2010 GreenPromise.com All rights reserved. Help save the planet by spreading the news about natural and organic products and how to live an organic and green lifestyle. For reprint permission, contact the Green Promise editorial staff at reprints@greenpromise.com.